The Piratesons are just an average, everyday family. Average, that is, for families who live on Freak Street. Some of their neighbours include the Supersons, the Werewolfsons and the Zombiesons. 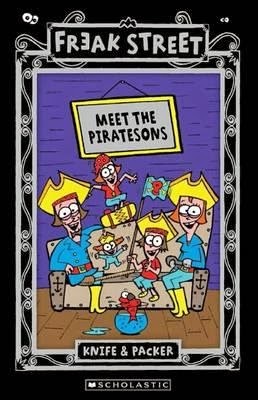 The Piratesons, who live in the middle of a pond with their pet piranha Phlippers, are Mr and Mrs Pirateson, Polly, Pattie and Paxton. When Patty removes a board of the bottom of their ship to make a skateboard, their home springs a leak. While fixing this problem, Mr Pirateson uncovers a long lost treasure map and so despite Patty’s entry in the City Skate Bowl Grand Opening, it is time for the Piratesons to embark on a treasure hunt. Full of illustrations, this is a fun book for young readers. The amusing antics of the Piratesons land them in trouble and it takes the special skills of every family member to get them out of the situation and back home safely. Supported by a popular website, www.freakstreet.com.au where kids can ‘join the freaks’ or learn more about the all the families on the street, Freak Street is a humour-based readable and accessible series for six to nine year olds. Heavy, glossy, colourful pages make this an attractive book to read and suitable for both genders. There are fifteen books to collect.